The Freeman-Kennedy Elementary School is a 96,400 SF school designed to accommodate 585 students in grades K-5. The building occupies a scenic suburban site abutted by residential neighborhoods and public park land on all sides. The overall design of the site provides the necessary facilities for education services, active and passive recreation, and vehicular/pedestrian circulation while increasing safety measures for students and staff members. Passenger car and bus circulation routes are separated to reduce queuing and vehicular conflicts. Pedestrian circulation improvements include sidewalks along and from Boardman Street to the entrance of the school and a large front courtyard area for student gathering. Numerous enhancements to active recreation amenities are also included throughout the design. New playgrounds are designed and separated by appropriate age groups. In addition, a large hardscape play area will be located adjacent to the playground serving Grades 2-5. The design also includes the renovation of all existing baseball and softball fields that are being disturbed during construction. 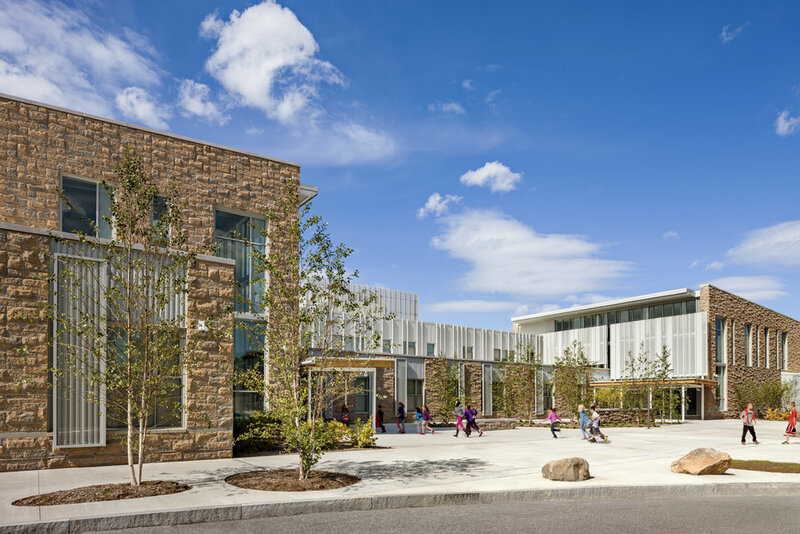 A critical goal of the project is to introduce sustainable design principles to connect the new school building with the surrounding landscape. Softening the architectural lines of the building, a series of vegetated screens, irrigated by roof runoff extend up the exterior walls, and provide natural shade for the wings of the school. At strategic locations within the new parking areas, bio-retention swales will collect and treat runoff from the surrounding pavement and provide a more aesthetically pleasing and ecologically sensitive solution to stormwater management. The design of the rear courtyard area will serve a didactic purpose, as it will provide an outdoor classroom setting and also serve as an interactive educational garden that will allow students to learn about the dynamics of the outdoor environment. Within the rear courtyard, a large rain garden planted with native and ecologically sustainable plants will collect, treat, and allow for the controlled infiltration of rainwater from the roof of the new school. In addition, the courtyard will include a large shade structure, designed to reflect the architectural character of the school building, which is large enough to accommodate full classes. The numerous active, passive, and architectural spaces throughout the project area are then linked by strong, linear plantings of native shade trees and shrubs and native landscape boulders, carefully designed in the motif of a riverbed leading through the rear courtyard rain garden. This riverbed motif is continuous throughout the site, and is perforated as necessary to accommodate each programmatic element. Thus, the overall layout of this aggressive design program, along with the creative use of landscape materials as a strong unifying element, portrays the new Freeman-Centennial School as a state-of-the-art, multi-use educational facility that works in true harmony with a sensitive ecological system.